It all started in the small industrial city of Yanbu, Saudi Arabia. Specifically, at a local convenience store called, Star Market. And as any normal child that’s too young to walk does, I’m crying and screaming uncontrollably in my mother’s arms. She’s doing her best to silence me out of respect for everyone’s hearing, but nothing is working. So my parents somehow manage to do a week’s worth of grocery shopping whilst having their ear drums brutally assaulted by me. But as with any good story this one is not without a hero, Super Checkout Man (the guy that happened to be working the till that day). From what I’ve been told, he took one look at me, smiled, and pulled a little Matchbox toy out of his drawer. He then placed it in my hand, and there was silence. Super Checkout Man had saved the day. Not only were tens of people saved from a trip to the audiologist, but for me, this was the beginning of a life long obsession. So what was the little Matchbox car, you ask? 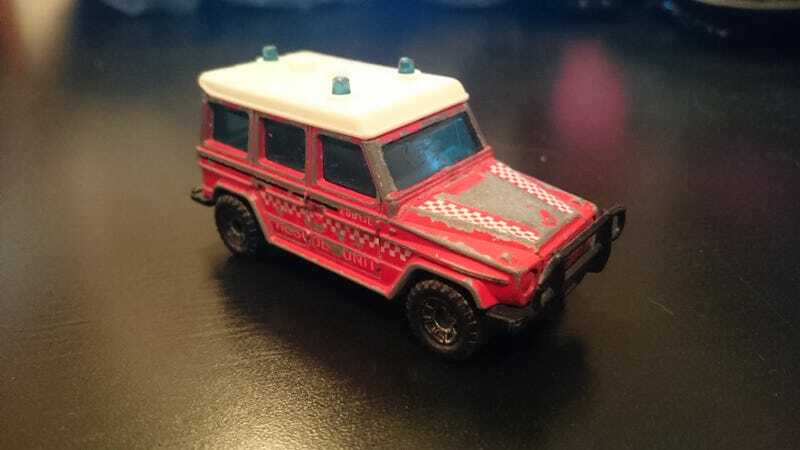 A Mercedes G-Wagen rescue vehicle. My parents are finally leaving Saudi Arabia for good, and as they pack up pieces of the house, little toy cars are coming out of nooks & crannies. The good ol’ G-Wagen was one of them, and I couldn’t be happier to share it (and this story) with you. How’d you get into diecast cars? What was your first?